In Chicago, everyone is suffering from a bit of cabin fever. We've just survived a cold spell that snapped records; nobody can see out of the salt-encrusted bus windows; we are still a good two months away from the return to normal time, meaning that many of the day's waking hours, we are in dark; and the holiday decorations are gone. So when the Lord blesses us with a day or two of temperatures in the forties, we hit the streets. Today, it was Grant Park and the Chicago Women's March. Some 300,000 people showed up, breaking last year's attendance number by about 50,000 people. The skies were blown out by the mid-day sun and the government was on a Trump negotiated hiatus, which buoyed the crowd. Like last year, the stage was at the corner of Jackson and Columbus in Grant Park--it might be advisable to rename these streets given the legacies of their namesakes, although I still have a grade school soft spot for Christopher, who sailed the ocean blue in 1492. Also like last year, there were far too many speakers who rattled on far too long. I get the need to give voice to diversity, but this event needed an editor. Start with the list of speakers, and then cut it by two-thirds. I do have to give credit to Fawzia Mirza, who serves as the EmCee. She has a pair of lungs on her, as well as bottomless pit of enthusiasm. 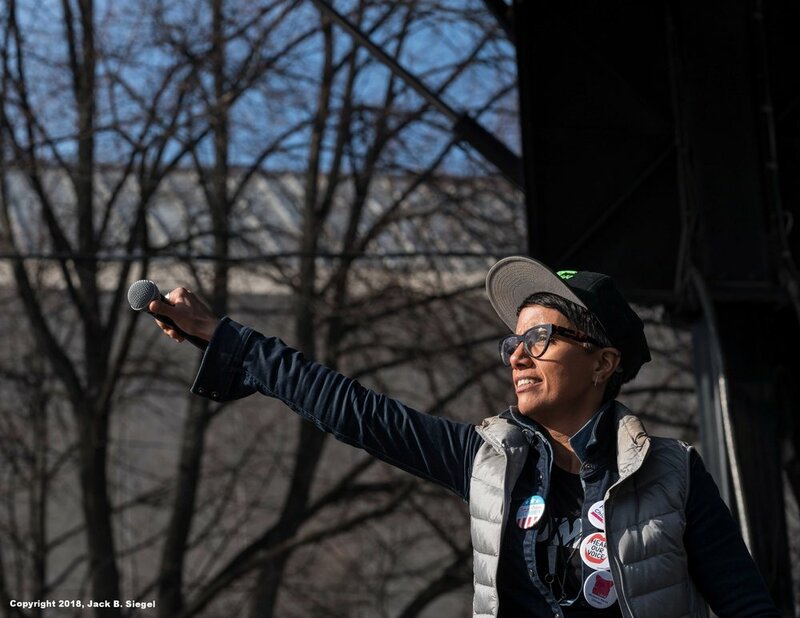 Among those who took the stage were Lisa Madigan, Illinois Attorney General; Kim Foxx, Cook County State's Attorney; Toni Preckwinkle, Cook County Board President; Channyn Lynne Parker, Transgender Activist; Quiana McKenzie, Regional Campaign Finance Advisor--Emily's List; and my favorite, Tom Steyer, Need to Impeach. Missing in action were our elected congressional representatives. Also missing was Chicago Mayor Rahm Emanuel, who seems to be allergic to public events that bring left leaning activists out. There was not as much music and entertainment as last year, which contributed to speaker fatigue. 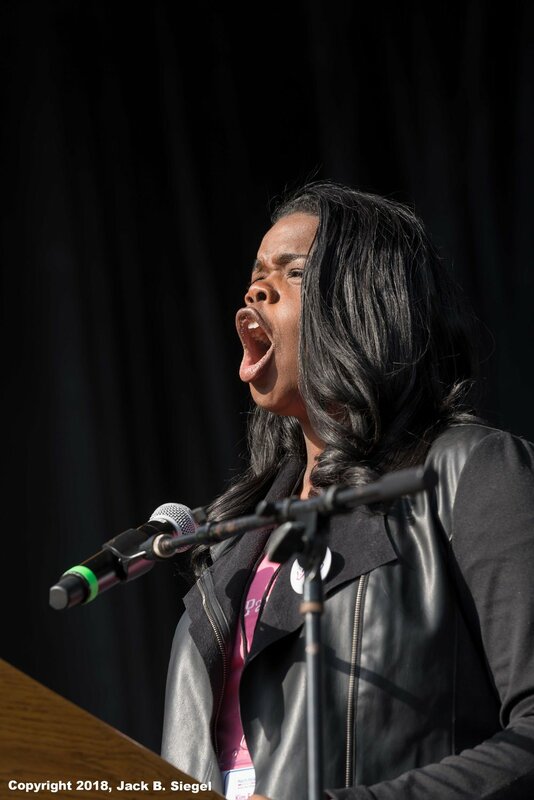 Last year's march (in place) was probably best summarized by Helen Reddy's first major hit, I Am Woman, Hear Me Roar. 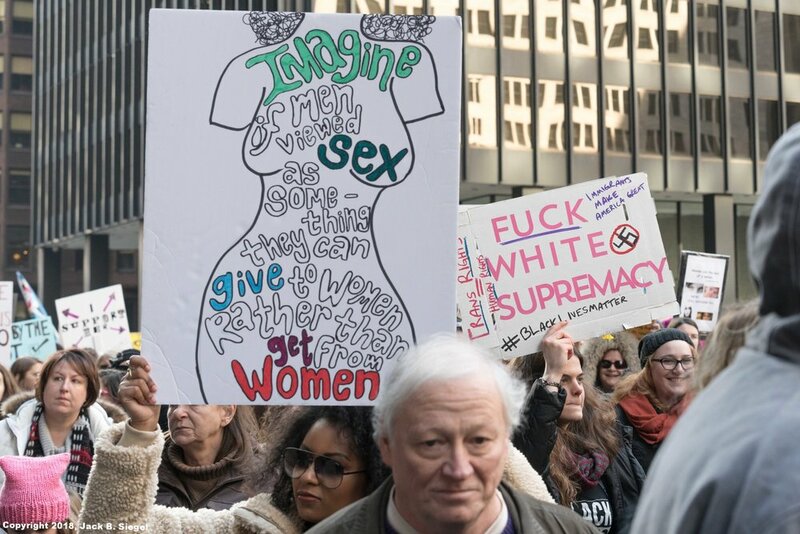 Women flexed their collective muscles, making their presence known in the wake of Trump's inauguration. We all remember the most notable line from that speech: "This American carnage stops right here and stops right now." Most suspected that the carnage was just beginning, as Trump and his minions began their efforts to dismantle our institutions and cultural norms. 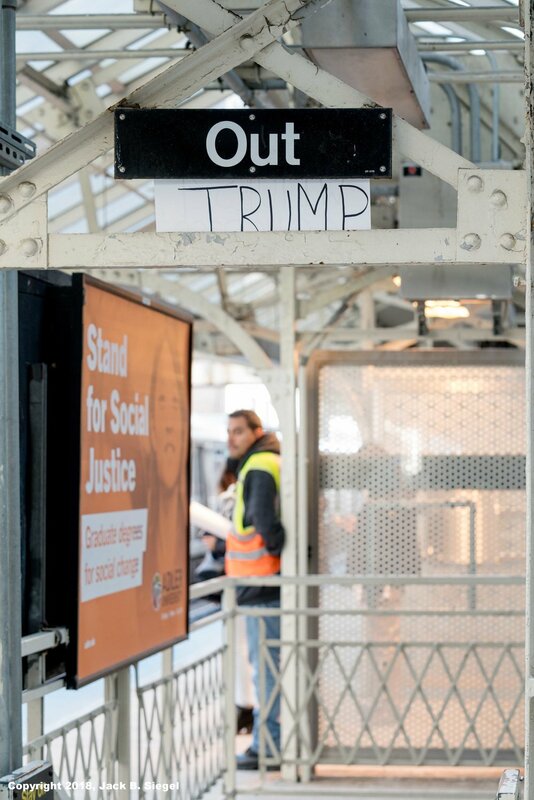 This year, the organizers made it clear that they were interested in stopping Trump in his tracks. Not surprisingly, that meant that the focus of this year's march was on the need to turn out the vote in November. After 2.5 hours of speeches, the crowd was directed to march to Federal Plaza, which is about four or five blocks west of Grant Park. While several helicopters hovered over head, the crowd did as it was instructed in an orderly and peaceful fashion. The exercise, however, was rather pointless from the crowd's perspective. 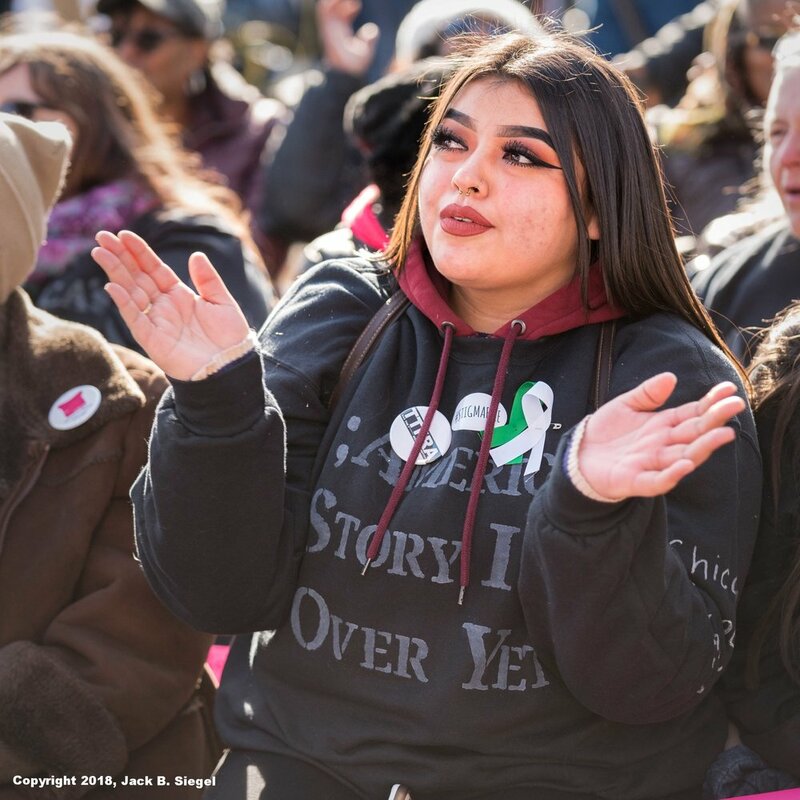 On arrival at Federal Plaza, the marchers were met by one group of anti-abortion activists and another religious group whose leader seemed to claim that the group did not hold political views, but was instead focused on salvation. Somewhat surprisingly, the Chicago Police Department bungled its job at this point. Things got pretty heated between some of the marchers and the anti-abortion demonstrators. The interlopers on the day's festivities should have been secured behind police barricades, as is the practice during the Chicago Gay Pride parade. One 70-something-year-old man got into a very heated screaming match with the anti-abortion folks. At times, it appeared that he was going to start swinging. Other than the two religious groups, nothing greeted the marchers when they arrived at Federal Plaza. Most passed through without stopping. I suspect that the police had asked the demonstration organizers to direct the demonstrators to Federal Plaza because it is about 8 blocks south and 4 blocks west of 401 North Wabash, the address of Trump Tower. I saw many demonstrators head to the El, board buses, stop for a late lunch, and head west to parked cars. In other words, if that was the police plan, it worked: The crowd dispersed. I, however, did head to Trump Tower, where bicycle cops, foot patrols, and one horse clustered around the bridge leading across the Chicago River to Trump Tower. Surprisingly, there was no crowd; just a few stragglers. But as the Tremeloes sang 50 years ago, Silence is Golden. Instead of a noisy crowd, signs from the demonstration were left on a concrete bench and along the wall that runs above the riverwalk. Tomorrow will not be as quiet, with a demonstration by more radical activists planned at 401 North Wabash. 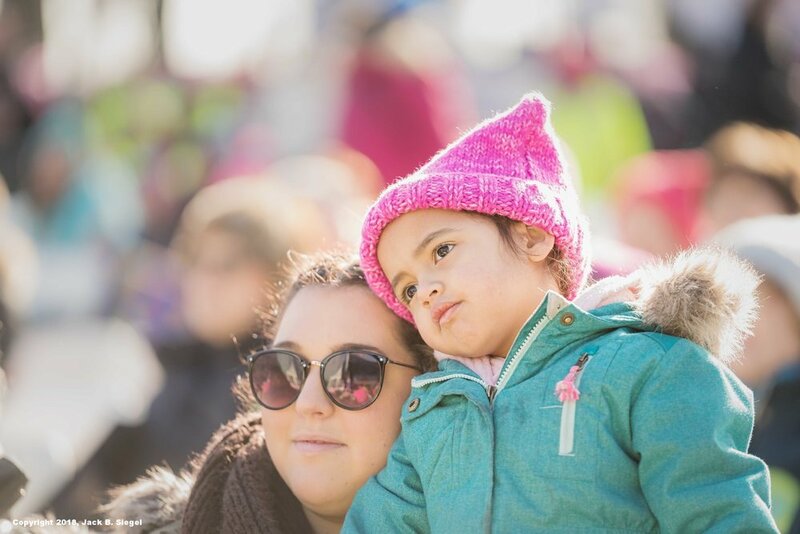 Overall, the 2018 Women's March was a positive event, particularly because it served as a nice counterpoint to the Government Shutdown that the Master of the Deal stumbled into through sheer incompetence and indecision. At the same time, the event lacked punch. Too many speeches and a rather pointless walk. The organizers will need to up their game if they want to break this year's attendance levels next year. In the end, however, the success of these events cannot be measured by numbers alone. Photographer's Note. I used the Sony AR7iii and the AR7ii side-by-side today. Sony has vastly improved the ii with the release of the iii. Battery life has been greatly extended; continuous shot mode is no longer halting; focus-point selection is now a breeze with the joystick; and dynamic range is expanded. It was nice to use two cameras that use the same lenses. It really reduced the weight of my kit. And as usual, I always fret over the shots that got away--there were three that I wanted, but I screwed up. One more thing: I could use a helicopter, but I don't think BHPhoto sells them. 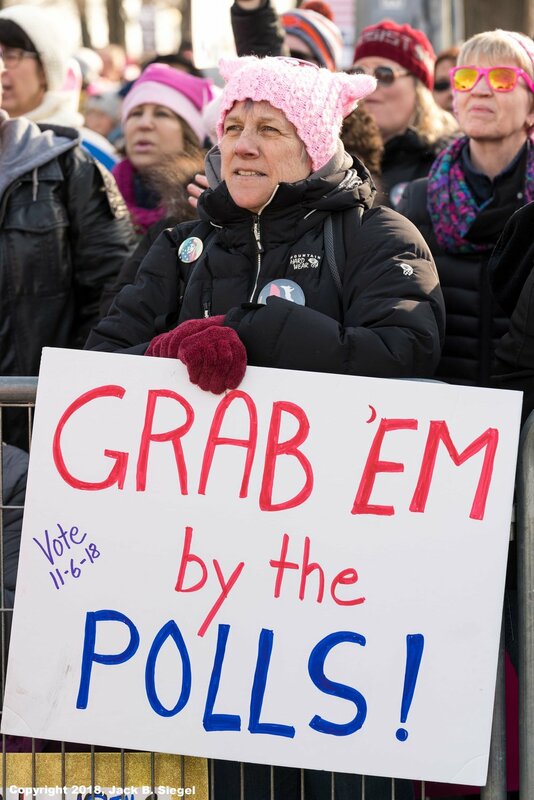 "Grab em' by the Midterms"
"I Will Not Go Quietly Back to the 1950's." Nor will I. 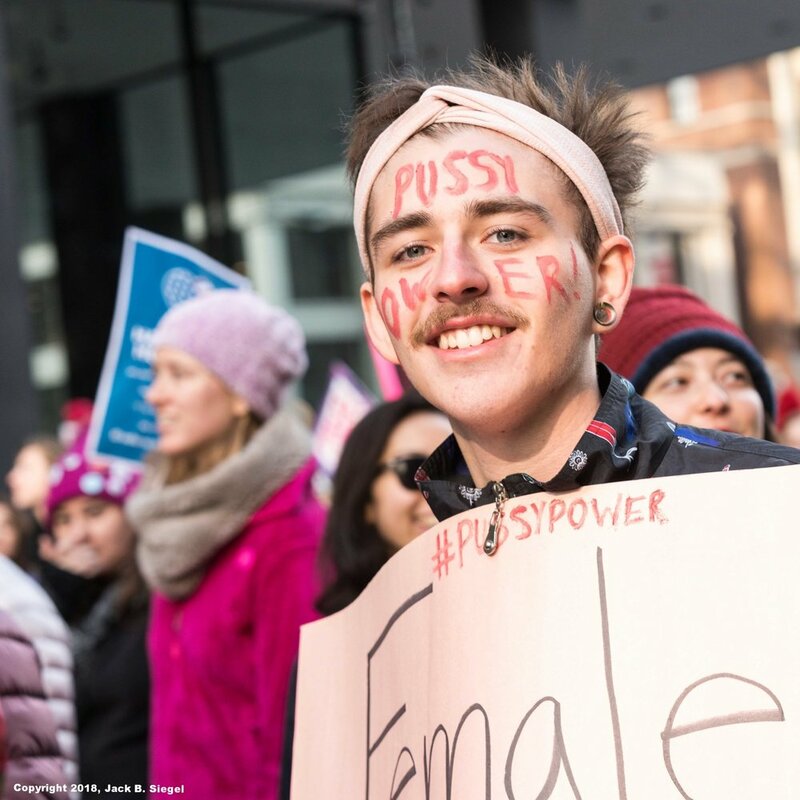 "Women of Color Are the Resistance"
He is All Atwitter: "#PussyPower"